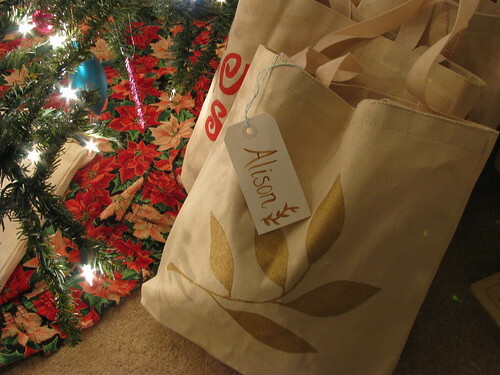 Last Christmas I went a little overboard with fabric gift bags. I cut a simple stencil out of card stock, traced it lightly with pencil directly onto canvas bags and painted with gold fabric paint. To leave the possibility of regifting the bags to others, I made tags with a similar sparkly bronze paint rather than painting names directly on the bags. I appreciated the little bit of extra shimmer under my tree before they went on to their new homes. 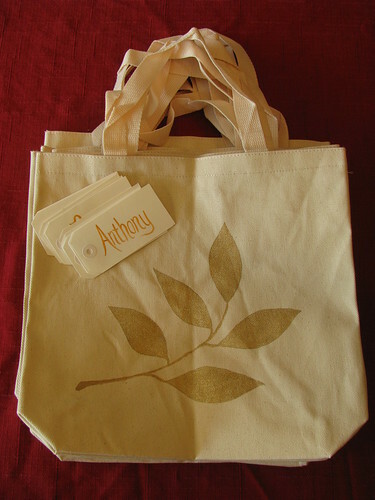 I made personalized gift bags for my youngest nieces and nephew keeping in mind that kids are naturals at creative play and that the bags could be a big part of the gift, too. I’d made them play food, so “Cooper’s Store” might have started as a grocery store, then gone on to be a book store, sporting goods store or pet store. Who knows what kinds of stores those kids have owned since then! 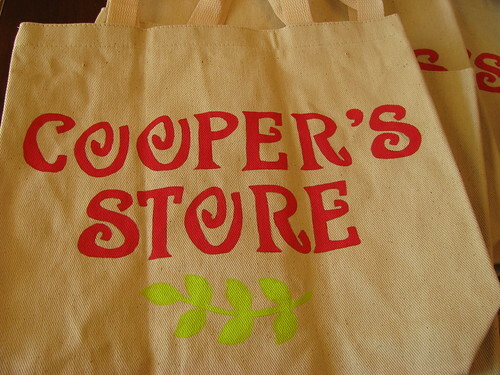 The green branch at the bottom was the Cooper’s Store logo. They’re a very environmentally friendly store you see, what with the reusable canvas bags and all.